Recently, I joined GreetingCardUniverse.com in an effort to try and sell some of my artwork that I turned into greeting cards. My thinking was that I had some fairly unique artwork that in turn, I could use to create fairly unique greeting cards. So I enlisted the help of a designer to take some of the messages I had created and use typography to create greeting cards with fun, out-of-the-ordinary messaging. 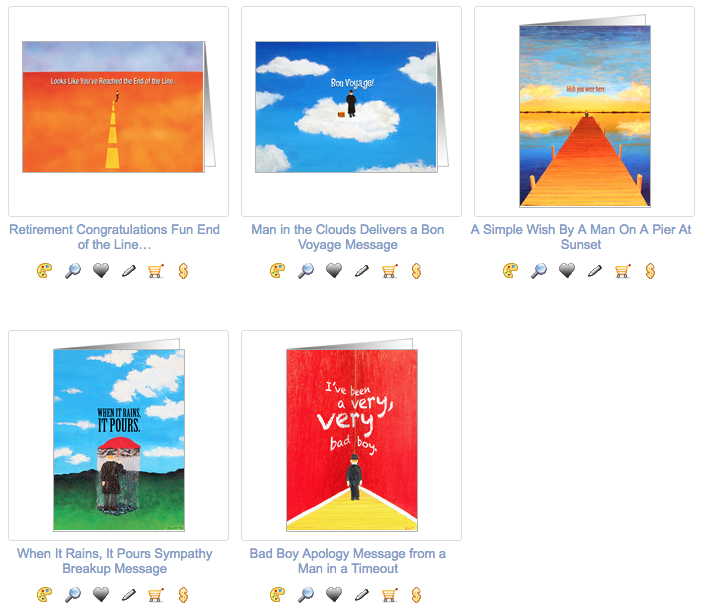 The five cards that are currently for sale on Greeting Card Universe. When I first announced that I had launched the cards, I was kind of excited. Getting them approved for sale is somewhat of an arduous task and that’s a good thing. You have to be pretty specific with your card descriptions and use of key words. The first day I announced that cards were on sale, I actually had a sale. To date, I’ve had two sales – which comes out to a whopping 70 cents of income to date. But no, I’m not giving up. I actually have plans to make a few more. And I understand that some of my card topics aren’t exactly heavily sought after items. I have a retirement card, a Bon Voyage card, a thinking of you card, a sorry about your bad luck card and an apology card for men or boys to give to their significant others. 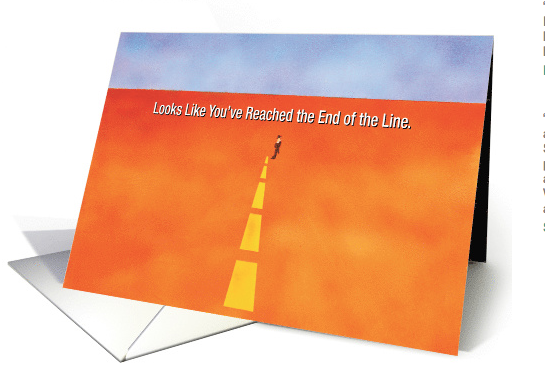 Here’s a closeup of my End of the Line Retirement Card. 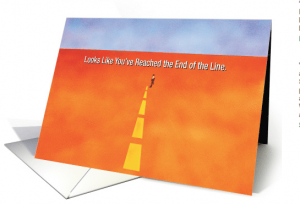 If you know someone who is retiring, please buy them this card! Currently, there are no birthday cards (rejected my one attempt), no Thanksgiving or Halloween or Christmas cards, either – I simply don’t have the paintings to back up those kind of occasions. And similar to my site on Pixels.com (https://tom-blood.pixels.com/), I’m just one fish in the ocean. Just like on Pixels, this site has thousands of designs from thousands of artists. Even if you want a Bon Voyage card (how many of those have you bought in the last decade – or even in your life? ), my version is still one of many available. So I don’t think I’ll be retiring any time soon off of the royalties I make selling these greeting cards. The same applies to selling my art on Pixels. There are millions of images on that site. I’m happy with the limited sales I’ve had and hope to continue to sell more in the future. (Now’s a perfect time to order for the holidays getting a pillow throw or iPhone cover or tote bag or just a coffee cup featuring some truly original art!) More important, I think it’s pretty cool that I’ve had more than 18,000 views of my artwork on that site since I joined in July of 2016. If only these people would buy something! In the meantime, I’ll keep on painting because I love to do so. If the painting seems like it could be turned into some sort of a greeting card, I’ll give it a shot. But I’m not creating art to turn into greeting cards – that’s simply an off-shoot. And obviously, I’m not making art to make a profit. Though I do hope to bolster my 70 cent earnings from greeting cards sometime soon! In addition to providing a wide variety of clients advertising and marketing services via BloodLines Creative, Tom Blood also creates surrealist-based art which you can view via http://tom-blood.pixels.com – allowing you to purchase prints or Tom’s artwork on a variety of items. The home page for Milpaws.com is direct and to the point. 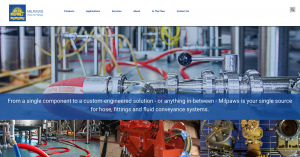 I don’t often get excited by websites for hose, fittings and fluid conveyance systems. But the new website for Milpaws (http://www.milpaws.com/) is a definite exception to the rule. 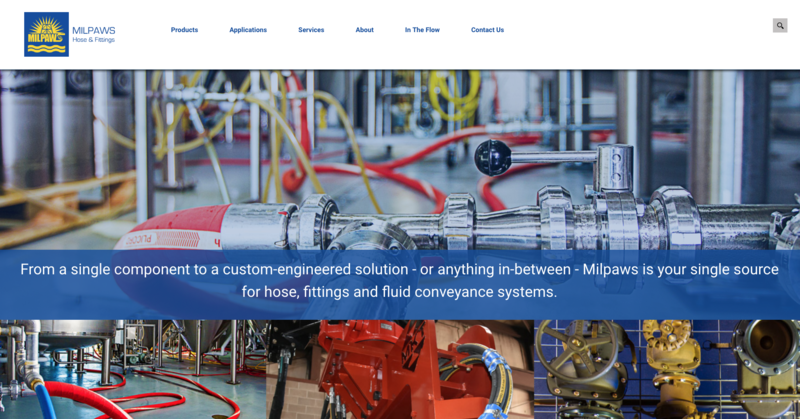 BloodLines Creative joined forces with E-Merge Interactive to design a whole new look for Milpaws – a supplier of hose, fittings and fluid conveyance systems here in St. Louis, Missouri. The photography is crisp and clean along with the design. Navigation of the site is easy – and there’s going to be an e-commerce portion coming in the very near future which will make it easier than ever for customers to order the parts they need. But that’s only part of the story. Milpaws is a company that is totally devoted to customer service and it’s their custom-made pipes, fittings and fluid conveyance systems that they’ve designed for a wide range of applications that enable them to stand out from the crowd. They’re a no-nonsense company that tells it like it is. A faulty connection that breaks down can cost a manufacturer thousands of dollars – sometimes reaching into six figures – and bring an entire production line to a halt. It’s imperative to work with a company that helps assure that every fitting and every custom-designed solution works on a day-in, day-out basis. And if something ever does go wrong, the supplier needs to be able to jump in and solve the problem immediately. That’s Milpaws. And that’s why we came up with the simple theme of “Don’t Ever Get Hosed By Your Hose.” No, we’re not using it as a tag line. It’s more of a description of the way they do business. The company’s DNA was forged as a commercial hose and fitting distributor in the St. Louis market over 40 years ago. Though Milpaws designs and fabricates fully-integrated Fuel and Potable Water fluid conveyance and dispensing systems for the US Military, their key focus has always been servicing contractors and contractor supply companies with both industrial and hydraulic hose and fittings to meet their needs on a moment’s notice. They know with Milpaws, they’re getting the best products, backed by the best service – no matter what the application – from industrial to environmental, manufacturing to utilities. There are some very simple things about Milpaws.com that makes navigating the site just a little more interesting. The Products page features an accordion-style drop down menu – click on a specific category and it opens right up, only to get folded back into the menu when you’re done. The Applications page features a parallax means of navigation where one category naturally flows into the other. We intend to make Milpaws.com a site worth visiting time and again for both customers and potential customers. The e-commerce portion of the site is currently being developed and that’s going to be a game-changer. We’ll also be regularly updating the “In The Flow” section with pertinent news a customer can use to help them with their business. Overall, it’s a very cool site in what was once a very boring category. Not anymore.